The sixth annual Pump Industry State of the Industry survey, which was conducted recently, is showing there’s an increasingly positive outlook for the year ahead despite the challenges a changing landscape is presenting. The industry is on the lookout for new opportunities to drive business growth in an increasingly competitive industry. Optimism is high entering 2019, as it rides the success of 2018. With the few tough years experienced by the industry now appearing to be well and truly over, the industry has steadily been finding its way back on its feet. That is not to say that there are no challenges facing the industry now or in the future, but there is a willingness by companies to adapt and take hold of the opportunities that are there. Figure 1: Company confidence has been slowly increasing since the downturn earlier in the decade. The Pump Industry survey this year produced some interesting insights around what has had a positive and negative impact on the industry, as well as business behaviour. While a number of respondents had a particularly good year in 2018, others struggled depending on the services offered and sectors they focus on. 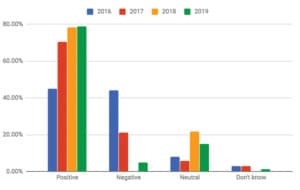 Following a tough few years at the start of the decade, the survey this year shows there is an increasing trend of optimism in 2019, with almost 80 per cent of respondents reporting that they had a positive outlook for their company, and 15 per cent are neutral. 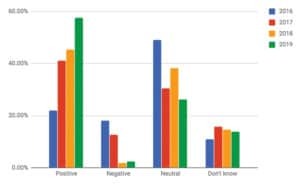 There is a slight increase in negative outlook with five per cent of respondents reporting this for 2019 compared to zero per cent in 2018. The increase in negative outlook could be attributed to a variety of factors, including the drought and changing customer behaviour. However, overall, comparing results over the past four years shows a growing positive outlook in the industry and a decreasing negative outlook. These results can be seen in Figure 1. The trend of a positive outlook is also reflected in Figure 2, which shows that 21.3 per cent of respondents felt their company’s performance exceeded expectations in 2018 and 55 per cent said it met expectations. Figure 2: Overall, companies felt that their performance in 2018 met or exceeded expectation. While almost 24 per cent reported that it fell short of expectations, this is almost six per cent lower than what was reported for 2017. Respondents expect this positive growth to continue, with a massive 80 per cent expecting their company to perform better in 2019 than in 2018. 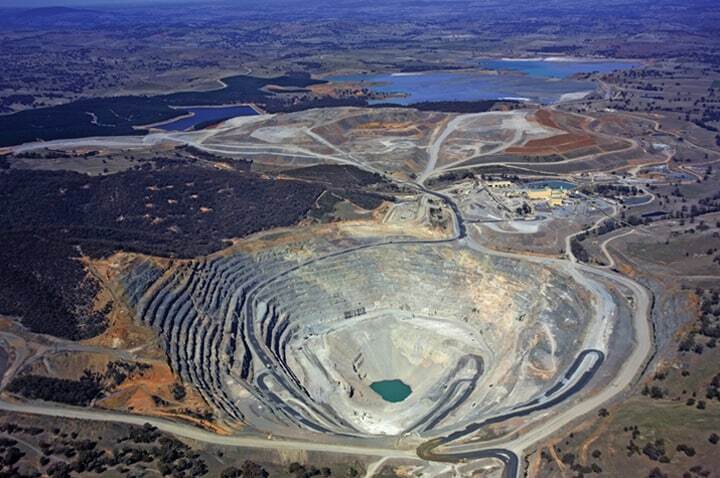 This continued positivity could be due to companies feeling there is a greater stability in the market than in past years, when there was greater uncertainty due to the mining downturn. Along with respondents expecting 2019 to be a good year for their company, the industry outlook as a whole is extremely positive — as can be seen in Figure 3. More than 57 per cent of respondents have a positive outlook for the pump industry in 2019, up by more than ten per cent when comparing to the expectations for 2018. Figure 3: What is the outlook for the Australian pump industry in 2019? This is a massive change since our 2015 survey, which saw only 22 per cent of respondents as having a positive outlook for the following year (Figure 4). Key to understanding the current state of the pump industry is to examine which particular verticals performed the best and worst for businesses during 2018, and to identify how key sectors are expected to fare in 2019. We asked our respondents how the volume of work across key verticals had changed for their businesses during 2018, and how they expected them to change in 2019. Figure 5 illustrates the actual reported performance of various verticals for our respondents from 2016–2018, and their anticipated performance in 2019. How did the verticals perform in 2018? Figure 4: There has been a trend of increasing optimism in the industry over the past four years. According to our respondents, the best performing verticals were water and wastewater, irrigation, and mining. On the other hand, the vertical that performed the worst was plastics and rubber, which was the only vertical to experience somewhat of a decrease in the volume of work. There were mixed results in the volume of work reported for 2018 compared to 2017, with building services/HVAC, power generation, and pulp and paper not performing as well in 2018 as initially expected. 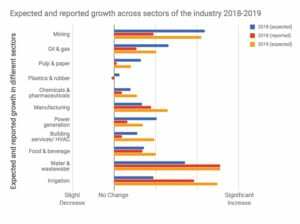 Other verticals saw an increase, and in a turnaround, the oil and gas sector saw an increase in work, following a largely negative performance in 2016, and poorer performance in 2017 and 2018 than expected. 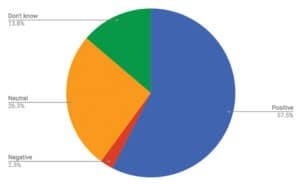 Figure 6 shows a breakdown of which verticals are expected to drive growth in 2019. Similar to respondent expectations for 2018, the water and wastewater, and mining industries are expected to be the best performing verticals in 2019. Most respondents think the volume of work in these areas will increase in 2019. 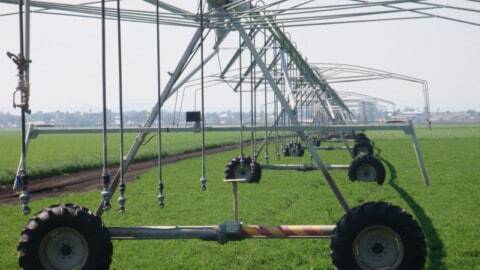 The irrigation sector is also expected to see continued growth in 2019, following a greater increase in work in 2018 than originally expected. The outlook for manufacturing is also positive, with the sector seeing a steady increase in performance over the past few years. What is making an impact on the industry? Figure 5: Reported growth areas by vertical from 2016-2018, and their anticipated performance in 2019. Figure 7 shows the areas of growth reported and predicted across the industry. 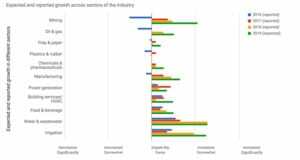 Water and wastewater did slightly better than expected in 2018 with more than 15 per cent of respondents reporting the volume of work had increased significantly and more than 40 per cent said it had increased somewhat. Almost a quarter of respondents said the volume of work had not changed, and only 5.66 per cent said there was somewhat of a decrease. This is compared to the reported expectations, where almost 40 per cent thought the volume of work would not change, 28.2 per cent predicted it would increase somewhat and 15.38 per cent said it would increase significantly. Expectations for growth in 2019 are in line with the volume of work reported in 2018. The better than expected results could be attributed to a number of factors, including wariness of performance heading into 2018 following lower-than-predicted growth in 2017. Respondents also noted that a focus and greater spending by government and water authorities on water and wastewater projects helped drive growth. Figure 6: What are the key verticals expected to drive growth in 2019? Irrigation also saw a much better result in 2018 than originally expected, with 5.13 per cent of respondents initially predicting that the volume of work would increase significantly, 23 per cent that it would increase somewhat and another 23 per cent predicted that it wouldn’t change. The reported results were much more positive, with almost 17 per cent saying there was a significant increase in work, almost 19 per cent that it increased somewhat and 28.3 per cent that it didn’t change. There was, however, 3.77 per cent that reported the volume of work had decreased somewhat. The better-than-expected growth in the sector has led to a positive prediction for 2019, with the volume of business expected to grow. There are upcoming opportunities that the pump industry can jump on, including a record funding commitment by the Federal Government for water infrastructure across regional Australia. Last November, an additional $500 million was promised for the National Water Infrastructure Development Fund. The fund’s expansion to more than $1 billion, as well as the existing $2 billion National Water Infrastructure Loan Facility program, means more than $3 billion is now available from the Federal Government to support state and territory governments and their project partners, to build new water infrastructure, and provide greater social and economic opportunity for Australians. However, while irrigation has been a booming sector for some, not all respondents saw growth in this sector. Not everyone thought the drought had helped propel business, citing that the continued dry conditions and a lack of water had seen the volume of work in the irrigation sector drop. The outlook considered by these respondents is expected to continue to have a negative impact on their business into 2019 if there isn’t enough rain. The severe drought across eastern Australia is heavily impacting sentiment in the nation’s agricultural sector, which could negatively impact the pump industry in 2019. The September Rabobank Rural Confidence Survey found the lowest farmer confidence levels recorded since the depths of the millennium drought in 2006. With dry conditions preventing many farmers from capitalising on what remain high prices for most commodities, the overall Australian rural confidence index dropped significantly in the latest quarter, with more than half of those surveyed having a pessimistic view of the 12 months ahead. The Rabobank survey found 56 per cent of the nation’s farmers now expect conditions in the agricultural economy to deteriorate in the coming 12 months, those expecting an improvement in conditions declined to 13 per cent, while 25 per cent expect similar conditions to 2017. These sentiments could affect investment in on-farm water infrastructure over the next 12 months, with the report finding that 21 per cent were intending to decrease investment in their farm businesses, while those looking to maintain current investment levels fell back to 59 per cent, and 18 per cent reported an intention to increase investment. This potential decrease comes despite positive longer-term business outlooks. It is likely that the pump industry will feel the effects differently depending on which state they service. In a positive sign for those servicing the mining sector, the mining slump seems to be well and truly over, with a report by the Department of Industry, Innovation and Science in the September edition of Resources and Energy Quarterly predicting a new export boom due to the combination of a weaker Australian dollar and the increasing global demand for coal, oil and LNG. The overall findings of the report indicate “strong economic growth, industrial production and manufacturing output” for Australia, with resource and energy exports expected to hit a new record high of $252 billion in 2018–19, before falling back to $238 billion in 2019–20. This outlook was reflected in our survey responses with the mining industry seen as one of the key factors that will have a positive effect on the pump industry in 2019 due to an increase in the number of mining projects and companies looking to reduce downtime. We also saw some mixed results in oil and gas, with some optimistic that it will increase, while others predict it will stagnate. There were a number of challenges respondents identified that impacted business in 2018 and would likely impact in 2019. Government instability and upcoming elections were identified as one of the challenges impacting the industry. One respondent reported that government instability had increased the level of business and investment pessimism, so companies were more cautious with how and where they were spending money. This sentiment was repeated by another respondent who said their performance for 2018 had been affected due to the underestimation of the impact that politics play in the overall economy. The outcome of state elections and the federal election next year were also noted as having an impact as it will determine where government funding is spent, with one respondent saying, “If government spending is affected in either direction, this will affect us in some form.” This has already had an impact in 2018 with some respondents reporting that there had been a decrease in government spending due to factors such as conservative end users in local government. Like last year, increased competition — both internationally and nationally, and online — was reported by respondents as being a key challenge, with a weaker Australian dollar against other currencies, cheap imports and manufacturing costs being some of the reasons cited for emerging competitors and supplier increases. A reoccurring response to the survey was that customers were still, for the most part, more focused on price over quality in order to get a quicker return on investment. 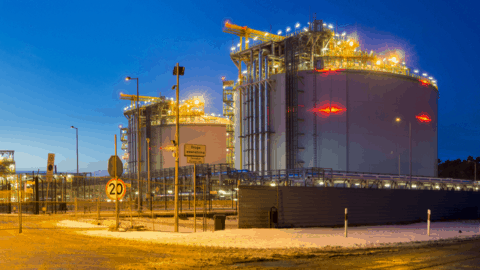 However, other responses suggested some end users are prioritising reduced downtime, reliability and energy efficiency over lowest capital cost. Despite this, companies are not letting increased competition drag down their business, and are finding ways to make themselves more competitive and set themselves apart from others. One respondent said, “We have met the high demands of our clients where other companies are falling short on. We have unique motors that other competitors do not have.” Others reported they expect growth from 2019 due to international expansion or will be looking at ways to reduce the impact. Another respondent noted customers were “looking for price justification, lifecycle cost of pump, quality after sales service and on time responses to calls”, which indicates there is an opportunity for companies to highlight the advantages of quality products in the long term, and set themselves apart by providing exceptional customer service. Another challenge noted by respondents was training and a lack of qualified professionals. Ensuring people in the industry are kept up to date is vital to meeting standards and having a reliable, long-lasting pump installation. Enticing and keeping trained staff in the industry is also important. A number of respondents reported that there has been a reduction in qualified, and interested, tradesman, finding suitably trained staff, and keeping staff in the industry. One respondent said there is “reluctance to invest in training of personnel to improve understanding of pump applications”, although another respondent indicated that the demand for qualified training is increasing. Employing suitably trained staff or getting staff to undertake regular training through industry association programs and other verified training courses could impact on businesses moving forward. There is an opportunity for businesses to expand if they are able to design, install and commission a pumping system that is efficient and reduces operating costs, and provide high-quality after sales support, and repair and servicing to ensure best performance of the pumping system. This can only be achieved if staff properly understand the pump and system. While the industry is facing challenges, respondents are finding new opportunities to diversify operations and move into new markets. There are several areas in particular that companies noted could be taken advantage of to help get them a competitive edge. New technology and innovations such as smart pumps and Internet of Things (IoT) have been slowly gaining traction and are predicted to continue to play a large role in industry expansion in 2019 and beyond. The extent to which new technology had an impact in 2018 was experienced differently by respondents, with some reporting little to no impact, moderate impact to mostly positive, but overall there was a sense that it was a growing area of opportunity moving forward and would continue to gain traction, especially in sectors such as building and irrigation where energy efficiency is increasingly valued. This was put down to factors such as “more informed and knowledgeable customers wanting technologically advanced material designs”, continuing improvement of technology and the desire for energy savings. 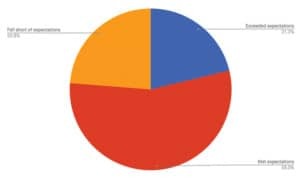 Another respondent noted that an increase in the use of variable frequency drive house pumps had propelled business forward in 2018, with 2019 expected to continue this trend and see increased business. An insight that was provided by one respondent — but has been identified by others in the industry previously — sees innovation as changing the industry landscape, moving it from a product supply to a system supply system. the devaluing of the product due to them being sold at minimal margins. As previously mentioned, energy efficiency is a key concern for end users who are wanting to reduce operating costs, as well as greenhouse gases. There are currently a number of changes to standards proposed, underway or newly implemented and government grants available for undertaking upgrades, which opens up business opportunities for the replacement of older inefficient units, as well as complete and quality pumping system design. Standards are seen as also playing a role in this with the new MEI Standards (Minimum Energy Index) identified as having a big impact due to the target of 25 per cent increase in energy savings. 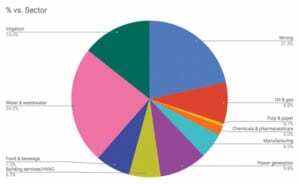 Respondents noted irrigation as a major sector where energy efficiency is providing opportunities. 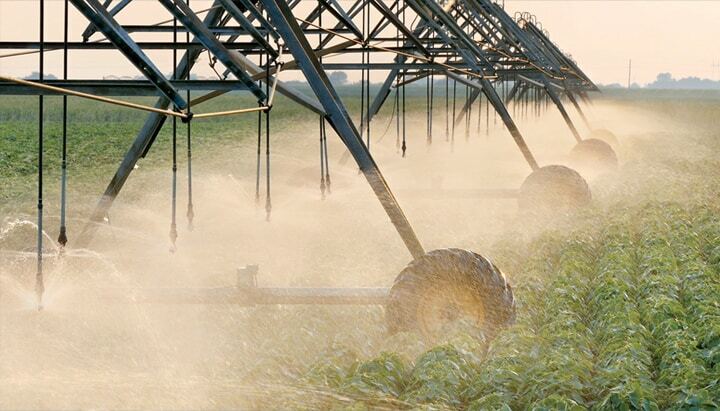 “This is a driving factor for all of our large-scale irrigators and also irrigation trusts and water authorities. Farming is all about controlling input costs because their products are priced by the commodities and currency markets of which they have very little control over, so power is becoming a serious drain on their revenue, which is why our customers are upgrading aging low efficiency pumping systems and using smarter control philosophies, which is a large opportunity for us,” one respondent said. Building and HVAC was another sector that was identified where energy efficiency was having an impact. The number of renewable energy projects gaining traction is also having a positive impact on the pump industry, with more than 32 per cent of survey respondents predicting this will continue this year. 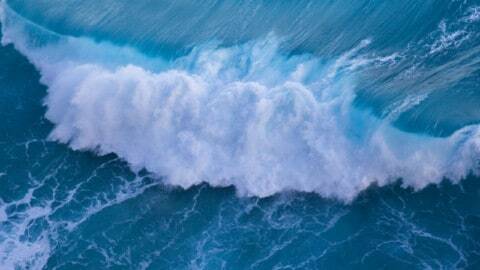 Opportunities in pumped hydro, in particular, are increasing as Federal and state governments seek to incorporate more renewables into the power grid. In 2017, an Australian National University report found at least 22,000 suitable locations nationwide for construction of pumped hydro storage plants, which has since been refined to 20 promising sites across different states, with a desktop review of geology, high-level engineering arrangements and approvals requirements. Funding is the biggest problem currently facing the development of pumped hydro as the high set up costs for private companies is a hindrance to entering the market. There is Federal and state government funding available, but this is primarily for feasibility and pre-development studies, and accelerating engineering, design and development activities. Solar powered pumps are another area of renewables where respondents said there were increasing opportunities as end users, especially irrigators, seek to reduce the costs of electricity and diesel. 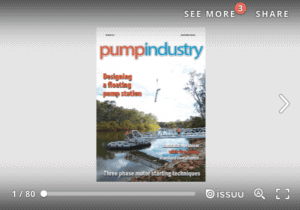 With the water and wastewater, mining and irrigation industries expected to continue growing in the new year, and new trends to take advantage of, the Australian pump industry is entering 2019 with an overall positive outlook. While government and increased competition from online and overseas will bring challenges in 2019, there are also numerous opportunities for the industry in the coming years for those willing and able to take hold of them, and adapt to the changing landscape.